For a modern culture that does not highly value life, it is paradoxical that we don't want to talk about the dying process or the possibility of an afterlife. Catholics sometime suffer from the same hesitation about talking about death. Yet the Roman Catholic religion and culture are a constant preparation for that moment when we must trust Jesus for our salvation. All the rituals and sacraments, prepare our minds and hearts for that thing from which there is no escape. What disappointed you about The Catholic Way of Dying? I'm hard of hearing so I appreciate a narrator who speaks clearly but this one is just awful, WAY too slow, boring singsong,. it was not conversational so I found myself drifting off because she took so long to get through a sentence. Very disappointing. What was most disappointing about James Nugent’s story? This seems written for someone who has absolutely no understanding of the Catholic Church, very basic and simplistic information. I was really expecting a discussion of Catholic ethical issues surrounding death and dying in light of the growing popularity of euthanasia. Who would you have cast as narrator instead of Marlene C. Bertrand? she sounds like a computer voice. What character would you cut from The Catholic Way of Dying? As a devout Catholic and a Hospice and Palliative Care physician, I think this book would be helpful to anyone who as a family member who is dying. it reminds us of the why of our rich Catholic heritage. The only two criticism I would have is the reader reads a little too slow. Also, it is perhaps a little too optimistic about few people going to hell. After all, our Lady in Fatima reminds us the people are falling like leaves from a tree. 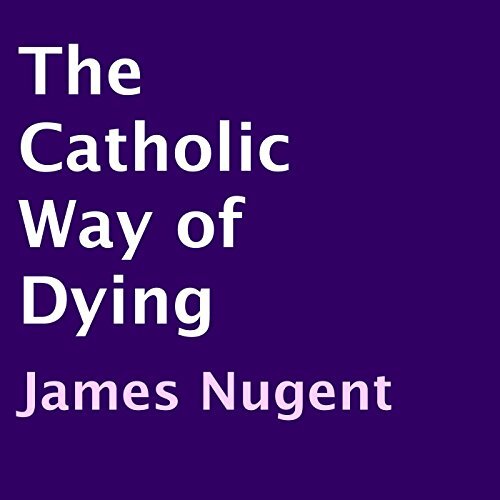 This may suit as an introduction to those who are not members of the Catholic church however for life long members it has not a great deal of content to get their teeth into. It is light in content. In addition the narrator reads at a very slow pace.